I attended a screening of this movie and I'm still in awe. My emotions have not returned to their proper state. 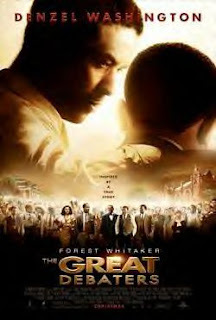 The Great Debaters, starring and directed by Denzel Washington is a story inspired by Wiley College Professor Melvin Tolson (Washington), who in the 1930's encouraged a group of African American students to start a debate team at their small southern African American College. The team lead by Professor Tolson, in the film, went on to beat Harvard University ( it was University of Southern California who they actually defeated in 1935) all due to a professor going the extra mile and students willing to join him, they were able to turn potential into greatness. Two of the things I enjoyed most about the film were the young students, despite the racism that was truly a blatant fact of life, it did not take them off of their journey. There weren't any "oh the white man is trying to hold us down", moments in the film, these students were in tune with their gifts and the power of words, which as a result, they left a legacy. I also enjoyed the awesome life changing quotes. The acting in this film was beyond superb and the subtle acting was great. Henry (Nate Parker) took a Denzel acting pill. He had sooo many Denzel moments. I didn't know who I was watching at times. Brilliant character delivery. Samantha (Journee Smollet) she looked beautiful and delivered a moving and outstanding performance of Samantha. James Jr (Denzel Whitaker- no relation to Forest) Two Words. Brilliant and Amazing. I so wanted to just squeeze his cheeks. Movie in theaters Christmas Day!